This is the very first scratchboard that I ever did. A detailed pencil sketch of the subject was first prepared on tracing paper. Then the back side of the tracing paper was layered with a red chalk. The sketch was then transferred to the scratchboard using a stylus and a very light touch. 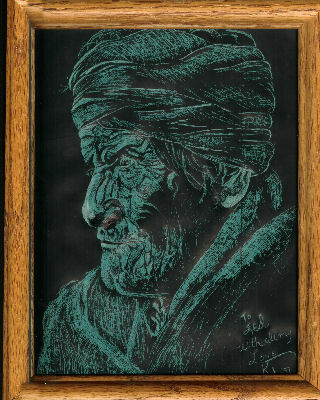 The red chalk is reasonably easy to see on the black scratchboard. Sharp tools are then used to "scratch" out the highlights and bring the drawing to "life." This particular scratchboard had an underlying blue layer under the black India ink layer. Makes for a very unusual and interesting effect. 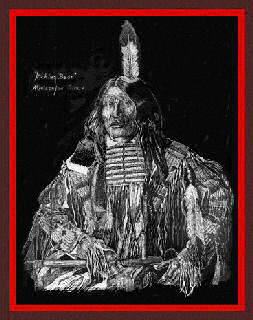 "Kicking Bear", a Miniconju Sioux. For those unfamiliar with scratchboard, I shall attempt to explain.� A thick clay coating is applied to a rigid hardboard backing. �Then several layers of black India ink are applied (usually with an airbrush). �Various shapes and sizes of sharp tools are used to "scratch" through the ink layer to reveal the underlying clay layer thus producing an image. I find this is a fascinating medium to work in. �You must train yourself to "think in reverse" so to speak. �Unlike drawing, in the conventional sense, where you draw the dark areas and leave open areas for the highlights, in scratchboard you "scratch" to reveal the highlights and leave open area for the dark areas and shadows.